Insulin resistance is seen with PI based of regimen. INSTI or RPV can be used. Based on recent published data and recommendations, the treatment regimen of zidovudine, lamivudine, and lopinavir-ritonavir is no longer the most effective/best therapy for pregnant women newly diagnosed with HIV. 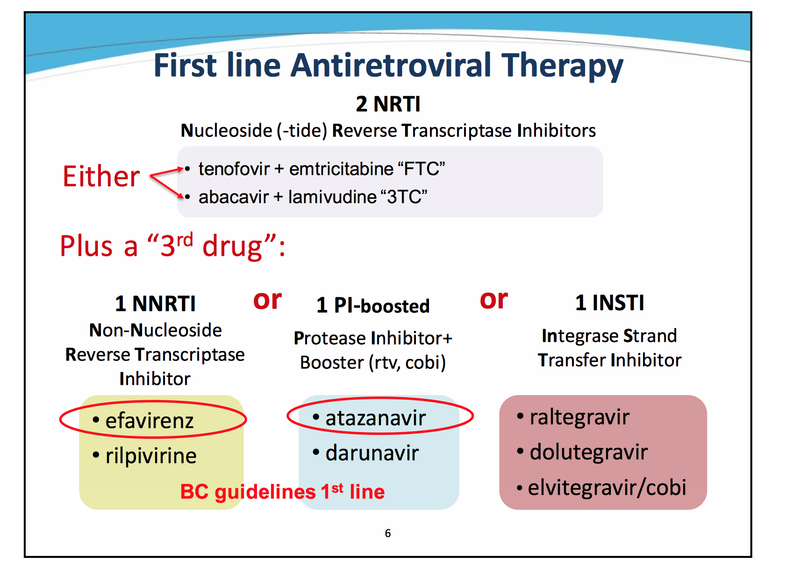 Recommendations now indicate a dual nucleoside reverse transcriptase inhibitor (NRTI) combination (abacavir-lamivudine, tenofovir disoproxil fumarate (tenofovir)-emtricitabine or lamivudine, or zidovudine-lamivudine) in combination with either a ritonavir-boosted protease inhibitor (atazanavir/ritonavir or darunavir/ritonavir), a non-NRTI (efavirenz initiated after 8 weeks of pregnancy) or an integrate inhibitor (raltegravir). Mostly with PI based regimen and is due to Ritonavir. Often can decrease with time if patient can tolerate. RPV requires acidic pH for absorption. Use of PPI is contraindicated. 63 yo is seen for HIV. What HIV regimen to start? 55 yo M with AIDS is seen for headache. 57 yo AAF is seen for HIV follow up. Patient has been on HIV medication for 5 years. Her HIV regimen includes the following. What kind of HIV regimen is patient on? Now the CD4 count is 63, what is the next course of action? Which drug testing to order and for what purpose? Now that we have the results of viral testing, appropriate medication is started. What is the next course of action? What if viral suppression not possible? 56 y-o M with ESRD, AIDS (CD4 70), HTN is seen in the clinic for HIV. Genotyping assay shows patient is sensitive to all medications. HIV PCR is 49,000. Patient also has HCV, with log of 4.5. 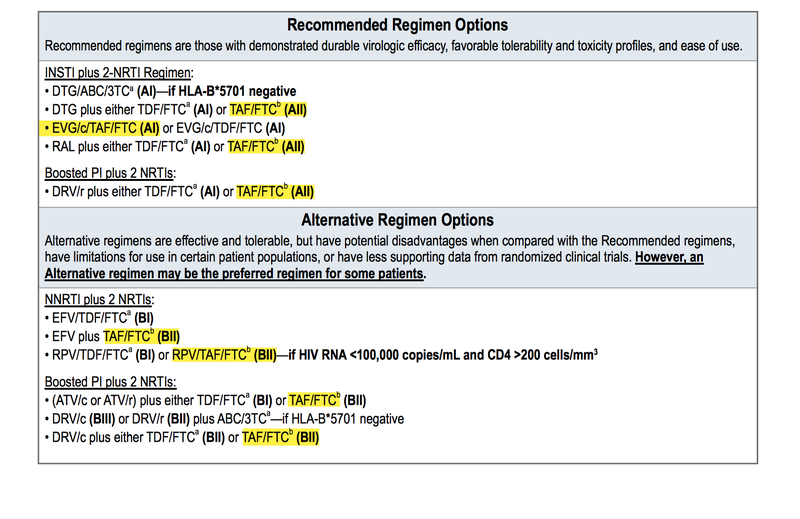 What is the best HIV regimen for this patient? 26 yo AAM with 1 mth history of worsening of mental status. HIV of ??? duration. MRI is normal. LP is normal. CD 4 count is 7. Viral load is very high. CMV: CMV in blood and CSF PCR was negative. Yet, cannot rule out when CD4 is that low. Retinal exam will be useful as well. M Tb: Less likely based on MRI and CSF but cannot be ruled out. Olanzapine, an antipsychotic agent. proven efficacy and relatively low risk of causing extrapyramidal symptoms and tar dive dyskinesia, which are highly prevalent among patients with HIV. 57 yo F with CD, DM - 2, Genital Herpes and HIV is being followed in the HIV clinic. She is on the following medication regimen. Patient has been previously on following medication regimen. In the parenthesis is the time when medications were discontinued. Patient had already build up resistance to efavirenz. Hence, Atripla was discontinued. patient had developed resistance to tenofovir, hence, Truvada was discontinued as well. Following medications were discontinued due to resistance to ziduvidien. CYP3A4 inhibitor cobicistat (brand name Tybost) - acts as a “boosting” agent, raising the drug levels of other ARVs. 65 yo M with new HIV diagnosis, CD4 15, Viral Load of 200000, and PCP. Asymptomatic CMV infection. HIV medication was to be started. Genotype shows no viral resistance. What medication options are available. 32 yo M is seen for HIV with PCP. CD 4 is 46. 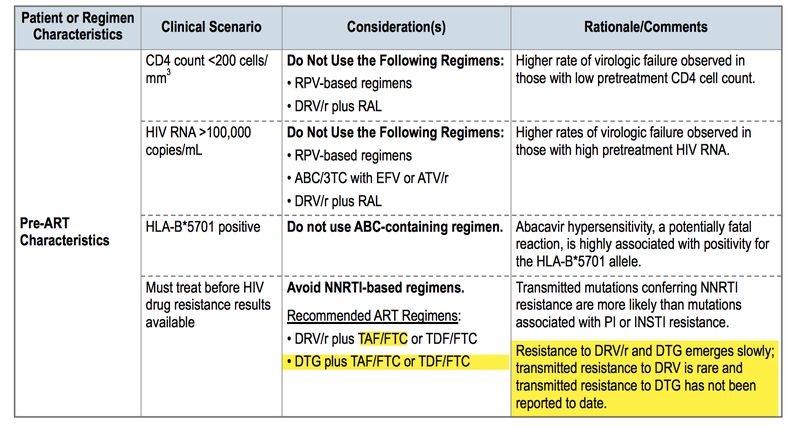 Viral load and HIV resistance study and HLV B 5701 tests are pending. Which medication to start? Why ? See table above in highlights. 58 yo M is seen for HIV. Also, has Hep B. How should the patient be treated? How should the next step? Also check for Hep C.
Hep C is positive. However, viral count is not detectable. 40 yo F is seen for AIDS. CD4 count is 30. Viral load is 400000. Any of the following medication can be started?